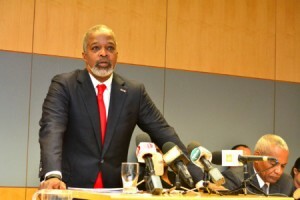 WILLEMSTAD - Central Bank of Curaçao and St. Maarten (CBCS) President-Director Emsley Tromp was back in his office for the first time since the Safire tax fraud investigation was launched against him. “He was unable to work for a year but returned last Thursday, so I assume his sick leave is over. The former Supervisory Board never took a decision on his position. “I had an earlier conversation with Tromp during which I indicated that it wouldn’t be wise for him to return to the Central Bank. He agreed and we spoke of an elegant way out whereby he would resign, but the content was to be negotiated further with the current Supervisory Board,” explained Gijsbertha. Having Tromp back at the helm would also conclude the role of Alberto “Chos” Romero as Interim President-Director. “We consider what now happened unacceptable and will move for dismissal,” added Gijsbertha. He realizes the latter could prove difficult based on the Central Bank’s statutes as well as the Supervisory Board’s regulations, and that the matter will probably end up in court. “So be it. We tried to do it nicely but that didn’t work,” argued Gijsbertha. The new board has already agreed to initiate a dismissal process. To prevent further complications and reputation damage to CBCS, an order measure was also taken banning Tromp from the premises and reinstating Romero as his replacement.